This fascinating tour is designed to highlight two of Indochina’s most exceptional countries. Discover Vietnam’s incredible diversity: walk through the ancient city of Hanoi, enjoy a boat cruise on the picturesque Halong Bay, experience a homestay with the Thai tribe people of Mai Chau, visit the old French battle field in Dien Bien Phu, and marvel at the peaceful countryside of the Red river and Northwest hill tribes. Explore the enchanting land of Laos, visit the UNESCO World Heritage Site of Luang Prabang, the sacred Pak Ou Caves, local villages along the Mekong river, and the beautiful boulevards of the capital city – Vientiane. This breathtaking and inspiring journey through Indochina is sure to astound you at every turn. Welcome to Hanoi: Vietnam’s bustling colonial capital. Your guide and driver will meet you outside the baggage claim of Noi Bai Airport and take you to your hotel in the city center. In the evening savor a welcome dinner at one of Hanoi's finest restaurants. Spend 24 hours on a traditional Junk Cruise in the amazing bay: a natural wonderland composed of jutting limestone islands and sparkling turquoise waters. Arrive at the dock around noon and board your junk. Savor a gourmet lunch of fresh seafood onboard as we sail out into the mystical bay. In the afternoon, cruise around some of Halong’s many islands, including Dinh Huong and Ga Choi. Along the way visit one of the bay’s 3 largest caves (Thien Cung, Dau Go or Sung Sot). Stop at an island cove with a sheltered white-sand beach and take a dip in the warm waters of the Gulf of Tonkin (weather permitting). Pass the night on your junk, lulled to sleep by the gentle rocking of calm waters. Awake early and participate in Tai Chi on the top deck or simply relax and watch the sunrise over the bay’s towering islands. Enjoy a morning cup of coffee or tea, before setting out to explore the nearby islands by rowboat. Return to the junk for brunch, then take advantage of the sundeck to admire the amazing rock formations of Bai Tu Long Bay as you navigate back to Halong City. Your driver will meet you at the dock and take you back to Hanoi. Enjoy a 3-hour Hanoi City Landmark tour. Your driver and guide will meet you at the lobby of your hotel and take you along highway No.6 to Mai Chau: a small town nestled in the midst of a lush valley and surrounded by emerald-green rice fields. Enjoy picturesque views of the scenic landscape, sown with pagodas and rural villages. Stop along the way to visit the Muong tribe and then at Thung Khe Pass for a spectacular view of Mai Chau Valley. Have lunch in Mai Chau then spend the afternoon trekking off the typical tourist track, along the Song Ma River. Trek through terraced rice paddies and small villages, discovering the natural beauty of the valley and encountering the culture of the White Thai people, living in the region. Stop at a Thai village for the night, having dinner with a local family and enjoying a live dance and music performance in the evening. Start the day with a simple breakfast with your host family. Farewell to your host of homestay drive to Son La. Let’s stop en route to visit villages of various tribes including the H’mong, Thai, Muong and Dzao and orchard, tea farm in Moc Chau plateau – Vietnam’s premier tea-growing region, before reach Son La (200km from Mai Chau) for a late lunch. In the afternoon, continue along winding mountain roads through North Vietnam’s stunning countryside. The most picturesque scenery here is Pha Din Pass, wellknown as a historical site during the 1st Indochina War ended in 1954, and a charming and dangerous pass at elevation 1,300m with breathtaking view. According to local legend, “Pha Din” means the connection between Heaven and Earth. On arrival, check in your hotel and spend rest of day at leisure. Accommodation: Hotel in Dien Bien Phu. Nestled in a heart shaped basin near the border with Laos, lies Dien Bien Phu. The famous historical battleground, where the Vietnamese successfully defeated the French, marking the end of French colonial occupation in 1954. Start the day early with a visit to the local market where you will meet charming Thai tribes in their traditional costume purchasing their farm products. The next is military base and historical site of the First Indochina War. We drive 30 minutes out of city to the base of The Command of Dien Bien Phu Campaign (Muong Phang) – Located in a primitive forest in Muong Phang commune to the commanding bunker of General Commander-in-chief Vo Nguyen Giap and Hoang Van Thai. In the afternoon, you will visit Dien Bien Phu Museum, built in 1984 on the occasion of the year 30th after Dien Bien Phu Victory before visiting A1 Hill - the most important camp of the French and Bunker of the French General De Castries. Some free time of your own in the afternoon relax by the hotel’s pool or strolling around the town. 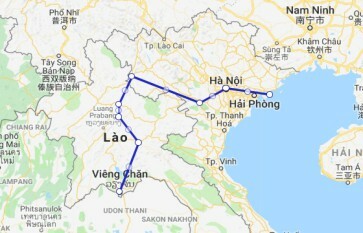 After breakfast in the hotel, drive down south through the peaceful Muong Thanh Valley to the Tay Trang border gate to Laos where our Laos guide and driver are await you. Crossing the border, you will continue through one of Laos’ most remote regions to Muang Khua, a one-horse border town located on the banks of the Nam Ou River. It depends on the time you may choose the lunch stop at Pak Nam Noy or drive 1 and half hour more to Ban Na My. Then continue the journey to Nong Khiaw – a charming rustic little town on the bank of the Ou River. It is squeezed in between some of the most fantastic limestone mountains north of Laos. Note: The Tay Trang border gate immigration normally closes for lunch between12.00 - 13.30. Accommodation: Hotel in Nong Khiaw. Have breakfast in the hotel then take a pleasant walk around the village enjoying the village feel with great views over the Nam Ou river or visit a small temple complex in the center of town. Continue the journey of 2 hours drive passing picturesque scenery along the Nam Ou River and beautiful mountainous setting heading to Pak Ou Caves - a pantheon of gold Buddha statues tucked into the nooks of the limestone cliffs. Enjoy the cruise along Mekong from the cave to village of Ban Xang Hai. Stop here to learn how local make LauLao (Lao whisky) and LauHai (Lao wine), before continuing this river way down the Mekong to Luang Prabang. Check in at the hotel then take an evening stroll through the quaint streets and enjoy the sunset over the river and surrounding lush countryside. The evening highlight includes a visit to the local night market in the city center, where ethnic minority people come together to buy and sell their wares. Situated where the Nam Khan River meets the Mekong, lies the fabled city of Luang Prabang - the former capital of Laos and a UNESCO World Heritage Site. With its lantern lit streets, lined with a mix of faded colonial mansions and sparkling mosaic temples, this city is known to enchant its visitors. Have breakfast at the hotel then enjoy a half-day tour through Luang Prabang. Begin with a visit to the Royal Palace Museum, then head to the magnificent Wat Xiengthong - representative of classic Laotian architecture, before seeing the impressive stupa of Wat Visoun and the shrines of Wat Aham and Wat Mai. Spend the rest of the day at your leisure, relax in one of the city’s many quirky cafés or stroll along the beautiful riverbank. Today you drive from Luang Prabang to Xieng Khuang, passing through Laos’ pristine countryside. This is over 7 hours journey with spectacular views of Laos’ rain forests and mountain ranges. Along the way you will stop for photo opportunities and visit various hill tribe villages. On arrival, check-in at your hotel and relax. Start the day with a trip to Phonsavan’s bustling central market. Visit the MAG (de-mining organization) exhibition before heading out to see the great stone wonders of Xieng Khuang, the Plain of Jars. First you will explore Site 1 where hundreds of large stone jars lie scattered about the enchanting plateau. Next, is the forested area of site 2 and a short scenic trek to Site 3, passing through the Thai Dam and Laos Leum village. Enjoy an afternoon tour of the old capital Muang Khoun and nearby villages of the H’mong and Thai Dam peoples. Today you take a short in-country flight from Phonsavan to Vientiane. Your driver and guide will meet you at the airport and take you to your hotel in the city center. After a short rest, set out on a sightseeing tour of Laos’ eccentric capital, visit all the city’s key attractions. Start the tour with a stop at Vientiane’s oldest temple, Wat Si Saket, filled with over 2,000 ceramic, gold, and silver Buddha images. Next we visit Haw Pha Kaew - the Royal Temple that once housed the famous Emerald Buddha, before continuing on to Laos’ most significant national monument: Pha That Luang. Conclude your tour at Patuxai, known as Vientiane’s own Arc de Triumph. This is a wonderful trip which was both varied and interesting, allowing you to see alot of the scenery and culture of the countries visited. I would encourage anyone to take this trip and if you have a month continue into Cambodia (we had already been so didn't do this part). The highlights for us were the cruise down the Mekong River and boat trip in Halong Bay which were truly wonderful. Laos in particularly is the most stunning country and I would recommend you visit before it becomes too touristy. Travelling with a group was fun but also there was time to explore on your own.